Platelet rich plasma (PRP) is a treatment used to promote healing of injured joints, muscles, ligaments and tendons. It is mostly used in athletes and active individuals who wish to return to their sport or activity quickly. It is considered in healthy individuals who have failed to respond to first line conservative treatments of rest, medication and physical therapy. What conditions might benefit from platelet-rich plasma therapy? How is platelet rich plasma obtained? How is the PRP injection administered? The PRP injection can be performed as an outpatient procedure. A local anesthetic is applied at the site and the PRP is injected into the damaged tissue. 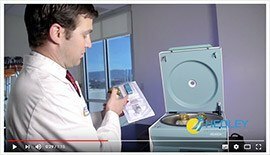 Occasionally, your doctor may use ultrasound guidance to administer the injection accurately. The number of injections based on the severity of your condition and response to therapy. What can you expect during the recovery period after PRP injections? The injection of PRP is an outpatient procedure, so you will be able to leave home immediately after. Following the treatment, you may experience irritation and mild pain for a few days. You will be prescribed pain medication to keep you comfortable during the healing process. As PRP therapy uses the patient’s own blood, the treatment is associated with minimal risk factors or contraindications.